“How do I help my dog at home if he starts vomiting?”…It’s a common question among dog owners. A dog may get an upset stomach due to a virus, from eating a new, unfamiliar food or from eating a non-food item. Whatever the cause, it’s important to closely monitor a dog who is vomiting, while also providing supportive care and home remedies to speed recovery. Begin by assessing the situation. Check your dog for signs of critical illness. Signs of a serious problem that requires immediate veterinary attention includes: pale gums, difficulty walking, walking with a hunched posture, a high temperature (normal is between 100.5 and 102.5) or severe dehydration. Do not feed your dog normal dog food. This will only upset his/her stomach further. Remove access to dog food. Give your dog a dosage of Pepto Bismol. The Pepto Bismol dosage for dogs is 1 teaspoon for every 20 pounds of body weight, given every 4 to 6 hours. Check with your veterinarian before giving any over-the-counter medications to your pet, especially if he’s on other medications. If your dog is actively vomiting, only give a half dose. Once your dog keeps that down for one hour, give the second half of the dosage. Withhold food and water for four hours or until vomiting has stopped for two full hours. Then, begin giving your dog unflavored Pedialyte in small amounts (no more than 1/4 cup for a medium sized dog every 20 minutes) to help replenish fluids and counteract dehydration. If the dog will not drink unflavored Pedialyte, try chicken or beef broth (onion-free) or water with beef or chicken bullion added to give it an appealing flavor. If the dog will still not drink, give the dog Pedialyte using a large liquid syringe or a turkey baster – this is vital to prevent further dehydration. Combat hypoglycemia (low blood sugar which occurs due to not eating) in a vomiting dog by offering Nutri-Cal gel or maple syrup. For every ten pounds of body weight, give one large spoonful of maple syrup. (a 50-pound dog will get five large spoonfuls) Give this every four hours. If the dog will not lick the spoon willingly, rub it on his/her gums – the dog will lick the syrup off his/her gums. Once a dog has stopped vomiting for 12 hours, offer a small amount of bland food – just a couple bites at first. A homemade bland diet for dogs is plain white rice or plain cottage cheese with a meat like plain skinless chicken (boiled) or plain hamburger meat (also boiled, with fat drained away). If the dog keeps the two or three bites of bland food down for four hours, offer a slightly larger amount – five or six bites worth of food. If he holds this down, offer an even larger amount in four more hours. Continue until the dog is eating 1/4 to 1/3 of his normal meal size. Then, feed the homemade bland dog food three to four times a day for two full days. Then, over three more days, mix in the dog’s normal food, while gradually phasing out the homemade bland food. This gradual transition is vital to prevent a relapse of the dog’s vomiting. If the dog vomits after that first meal, withhold food for an additional 12 hours and continue giving fluids (Pedialyte or broth) once an hour after the first four hours and maple syrup or Nutri-Cal every four hours. Offer food again after waiting the additional 12 hours. If the dog still cannot hold down food, it’s time to visit the veterinarian. 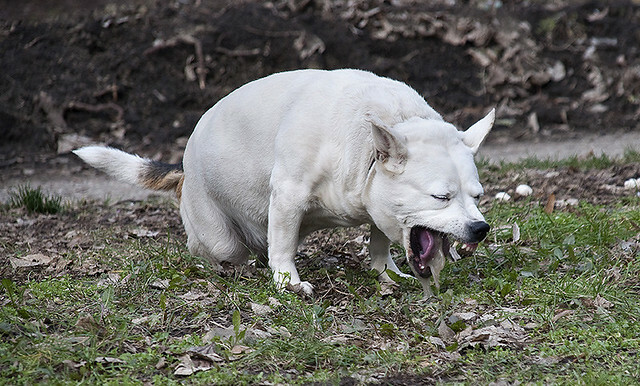 A serious problem – like an obstruction or foreign body in the digestive tract – may be to blame for the dog’s severe vomiting.